This week, our #SundaySupper theme is Mom's Favorite Recipes. This event is being co-hosted by Christie Campbell of A Kitchen Hoor’s Adventures and Wendy Leep Hammond of Wholistic Woman. Ahead of Mother's Day next week, they asked us to share one of our Mom's signature recipes...or a recipe that Mom would love! My Mom truly loves chocolate, so I decided to create a recipe just for her that combines some of her favorite flavors. 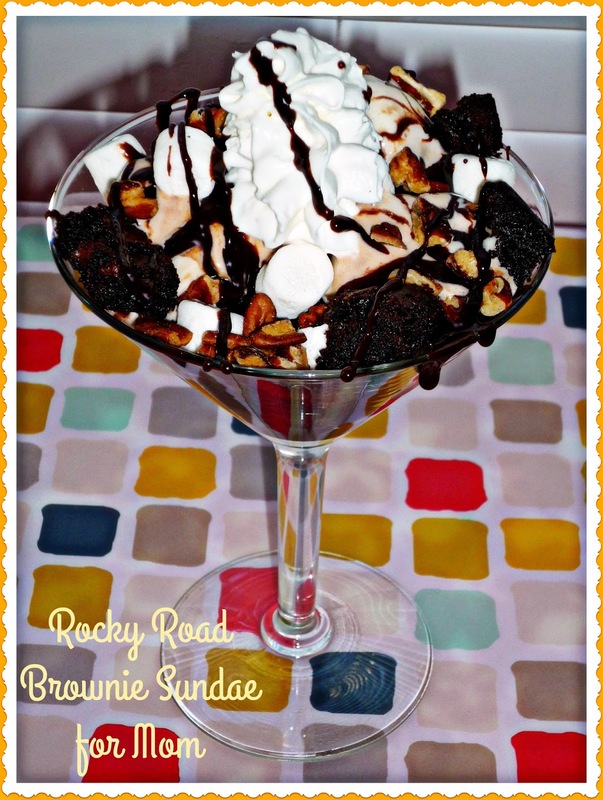 My Rocky Road Brownie Sundae for Mom is full of chocolate goodness, creamy ice cream, pecans, and marshmallows. It's gooey fun -- and I can't wait to make one of these decadent little sundaes for her when I go home to visit next weekend!! Step 1: Bake brownies per package directions. 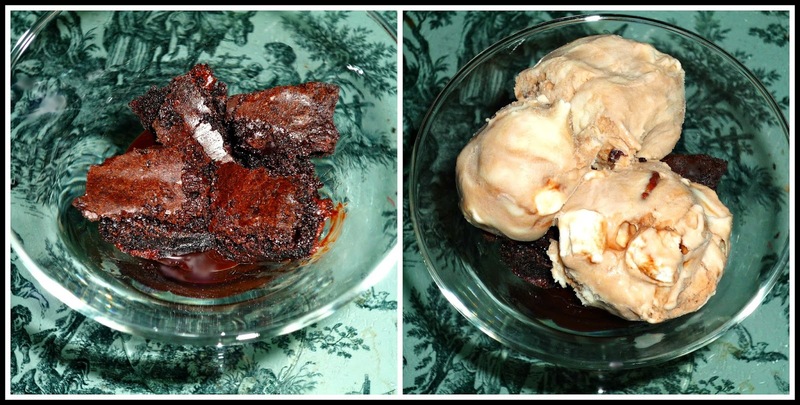 While the brownies bake, soften the ice cream. Add the softened ice cream to a large mixing bowl. 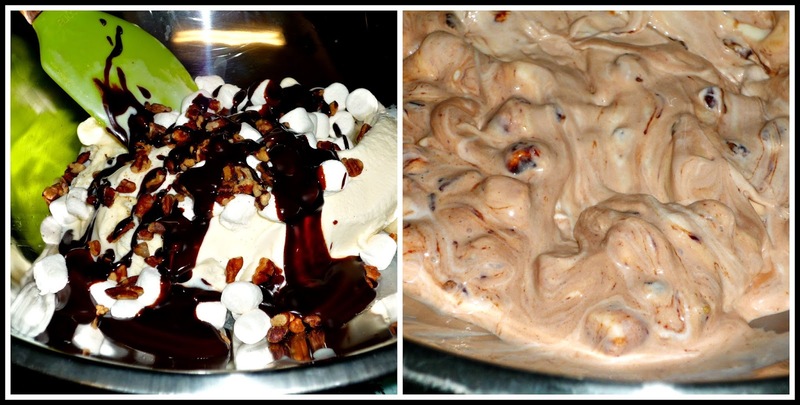 Add 1/2 cup of the warm hot fudge sauce, 1/3 cup chopped pecans, and 1/2 cup mini marshmallows. Use a spatula to combine the ingredients into the softened ice cream -- you want to see some streaks of vanilla ice cream. Spoon the ice cream mixture back into the container and freeze at least 2 hours -- or until ready to assemble the sundaes. Step 2: Completely cool the baked brownies, then cut then into 1-inch cubes. Place four cubes into the bottom of a clear goblet or martini glass. Use a small cookie scoop to scoop the ice cream mixture on top of the brownies. At this point, I froze my sundaes for 15 minutes before topping and serving. Step 3: Just before serving, drizzle the sundaes with more of the hot fudge topping. Sprinkle with additional pecans and mini marshmallows. 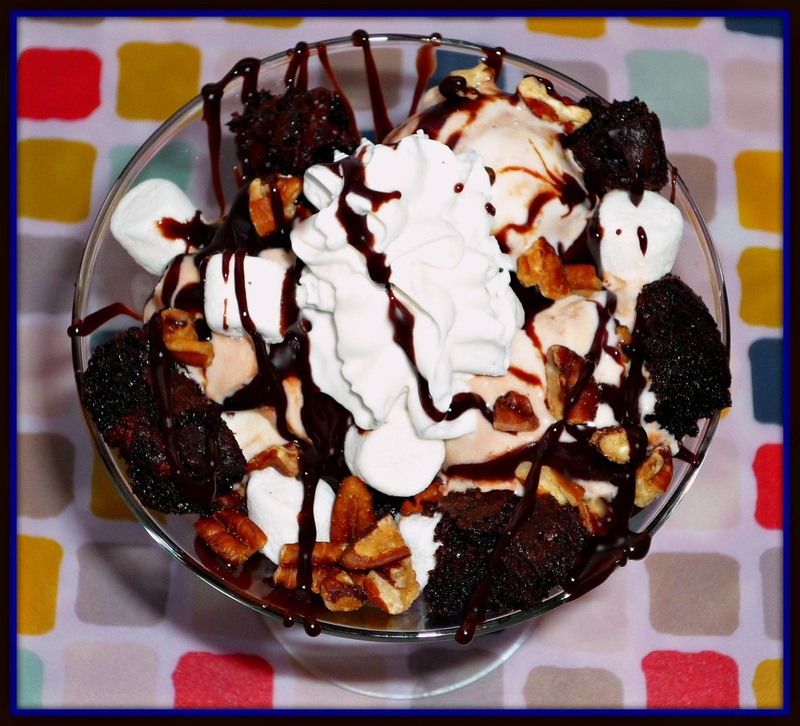 Add a few more small pieces of chopped brownie along the sides of the sundae, then add a bit of whipped cream to the center. Serve immediately. 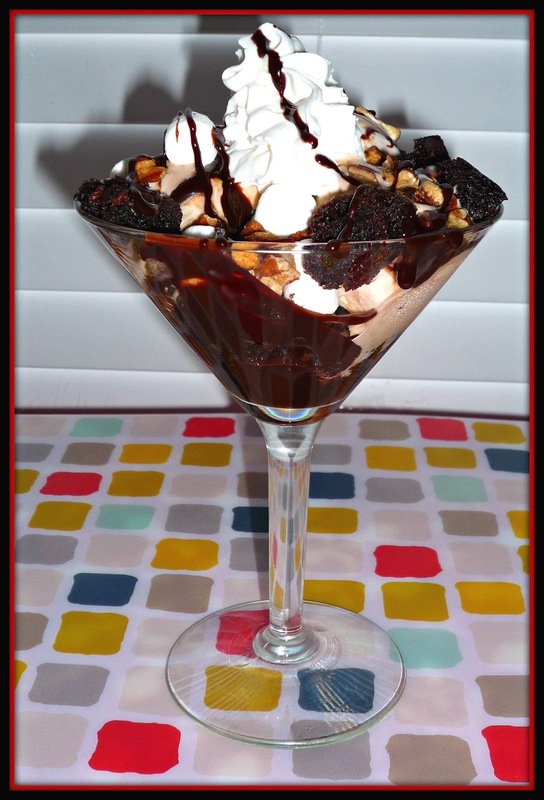 These decadent sundaes are quite rich, so a small serving goes a long way! Fudgy brownies are topped with creamy rocky road ice cream. The crunchy pecans and marshmallows add texture, and the warm hot fudge is a nice contrast to the cold ice cream. This is one winner of a dessert -- and I know that my Mom will LOVE IT next weekend when we celebrate Mother's Day! Be sure to check out all the great Mom-inspired recipes that this week's #SundaySupper participants are sharing...there's sure to be something that you'll love to recreate in your own kitchen! Be sure to join the #SundaySupper conversation on Twitter today! We tweet throughout the day, and we share recipes from all over the world! Our weekly Twitter chat starts at 7:00 pm ET 6:00 pm CST. Simply follow the #SundaySupper hashtag, and remember to include it in your tweets to join in the chat. To get more great Sunday Supper Recipes, visit our website or check out our Pinterest board. Would you like to join the Sunday Supper Movement? It’s easy! You can sign up by clicking here: Sunday Supper Movement.